Some pictures from my final afternoon at Caprock Canyons State Park Texas. This is a continuation of my earlier blogs Day 1 and Day 2. As it got late in the day and the afternoon shadows began to get long, I tried to get some good panoramas of the high cliffs in the long shadows. The sky was deep blue away from the sun and I thought that the cliffs lit by golden late afternoon sunlight would really stand out against the blue sky. And I hoped that the shadows would give depth and dimensions to the photograph. Below is a panorama of 5 images. I had problems with vignetting on these images. This was probably because I forgot to stop down the lens a bit (I always forget this when taking panoramas). These images were taken at f/4 on my 24-120mm f/4 lens. I had plenty of light and the shutter was 1/1250s, I just plain forgot to stop down. I was able to get the vignette down enough in Lightroom and crop a bit to get a usable panorama. 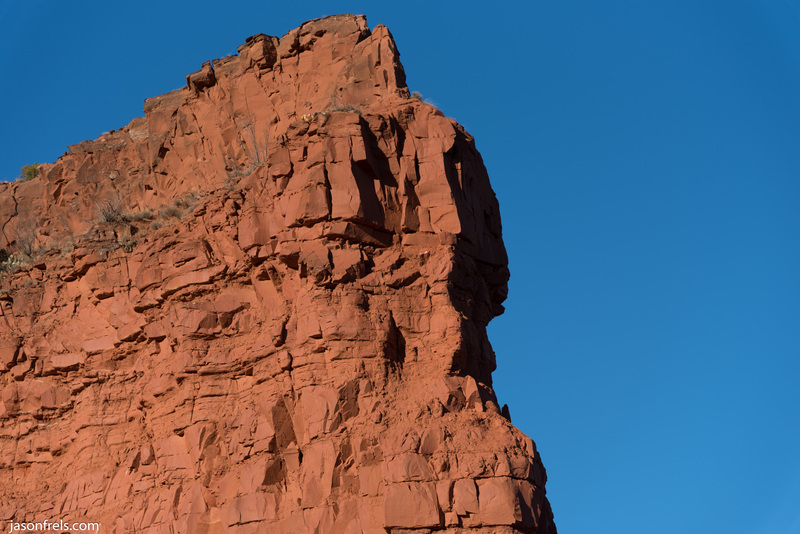 Below is a zoom of one of the high cliffs in the afternoon sun against the blue sky. If you look closely you can see cacti growing way up there on the cliff edges. This was shot at 120mm from far below. I was going for a picture with a lot of negative space directing the eye to the cliffs. It turned out almost abstract, I think. There are also Bison in the park, though you may have to go find them. I had a few pictures of them on a foggy morning the day before, but I managed to find them in a better place for a photograph on the next day. 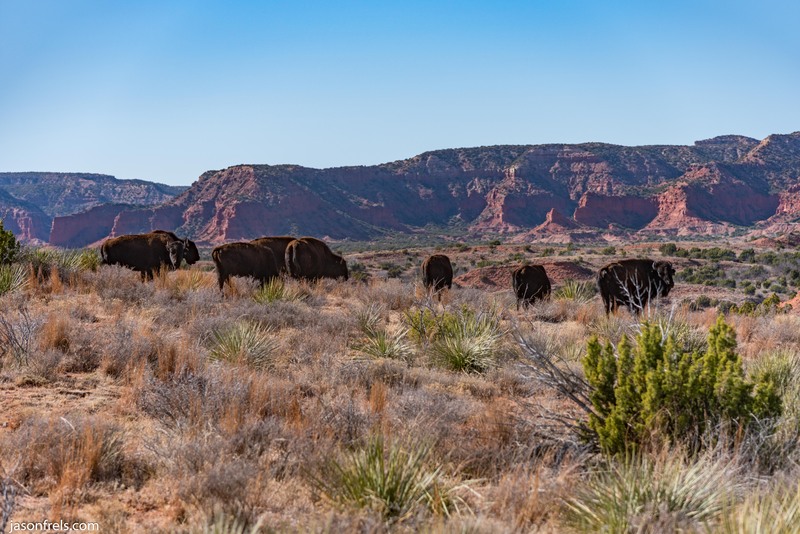 Here the Bison are in front of the cliffs in the background. Two of the Bison are actually looking at me. The biggest problem with this bison photo is the lighting. The sun was behind them and to the left and the bison, which are dark animals, barely come out of the shadow. I had to lighten this picture up considerably just to get any detail on the bison. I would have loved to get into a position with the sun at my back and the bison looking at me with the nice warm light on their faces, but I couldn’t easily get behind them and they were steadily moving away from me. So, not the great picture that it could have been. There is a prairie dog village at the park, meaning a big field of prairie dog mounds. At different times of the day, there are dozens of them running around and doing whatever it is they do. I pulled over, grabbed my 200mm lens and tried to get some good photos. This is a crop of a photo that turned out ok. The sun is at my back and lighting the little prairie dog well enough, though the ground is mostly dirt so they don’t read very well against that background. One thing that prairie dogs do, is sit up and bark when they see danger. 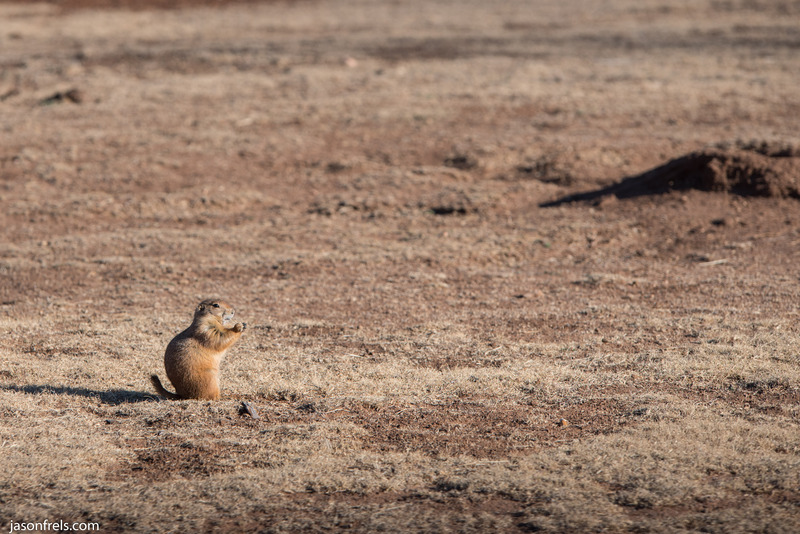 So, as I would try to get close enough for a good photo, the prairie dogs near me would run to their burrow and start barking to alert the others and they would mostly go hide. The 200mm lens is the longest lens in my bag and I had to shoot from a long way off to get them doing anything other than hiding. I think that this cropped photo turned out OK.
On this trip I tried a new folding cot for sleeping in my tent. I have never gotten a good night sleep on the ground, even with a sleeping mat. So, I finally ordered a cot for a tall person and put that in my tent. I have to say that this made all the difference. I slept hours uninterrupted on this cot even in the sub-freezing weather. I was interrupted one of the nights by deer or bison walking through my campground. The cot I ordered was Easy Cot, Portable Folding Cot by Byer of Maine. Folds up into a tight package and unfolds in a few seconds. So, that was about it for my camping, hiking, photography expedition in Caprock Canyons State Park. I was planning on staying another night, but the wind got really fierce and started blowing my tent pretty hard, so I decided to drive home that evening. I had been looking forward to seeing this place for quite a while and I was not disappointed. It is a beautiful place to hike and take in nature. I don’t know if I’d go at the height of summer, though. February was good for me. This place is a long way from a city of any kind so, it can get very dark at night when there is no moon. There is a small town nearby called Quitaque. You can get gasoline and there is a diner that has good food. Thanks for reading. Leave a comment if you like. The stitching process would have gone a lot smoother if I had remembered to heed my own advice about stopping down a bit to reduce vignetting. I had another pano that ended up with some lens flare in it. I don’t really hate the lens flare but it wasn’t as nice as this on anyway.